Who Ratted on the Rodents? 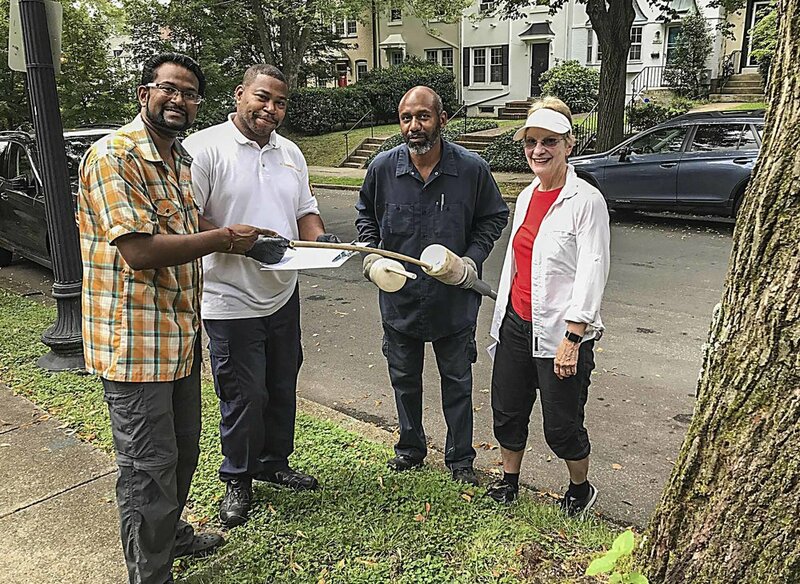 Kishan Putta and Linda Brooks flank two of the four city workers who inspected Burleith properties on August 18. Photos by Ross Schipper. Thanks to BCA members Massa Dunnaville and Kishan Putta for organizing the August 18 ousting of rats in Burleith. Massa publicized the problem, collected signatures and addresses from concerned residents, and contacted 311 for an inspection; Kishan expedited the request by liaising with the Department of Health/Rodent Control Division to facilitate the process and coordinate the eradication date. After publicity emails to the BCA listserv and the BCA membership database, an overwhelming number of Burleith residents signed up to have their yards inspected and burrows sprayed (if found) by DC Rodent Control. Janice Sims, our BCA contact for rodent issues, who has provided detailed how-to information on the Burleith website, was thrilled with these members' initiative. On the appointed date, Kishan met the city workers at his home along with BCA members Ross Schipper and myself. Ross and I accompanied the workers around the neighborhood to make sure they could find the yards of the 73 residents who signed up. Massa provided a large packet of signatures and emails authorizing the services, and Kishan consolidated the entire list onto one page the workers used to locate and inspect the properties. Rodent Control employee sprays a rat burrow. Massa initiated the project in late January via a first email to the Burleith listserv and a request for rodent inspection made via a call to 311. Her target at that time was the alley between T and S bounded by 36th and 37th. Things didn't get serious until her second email to the listserv on August 2 that was focused on collecting signatures on the petition required by the Rodent Control Division. At this point the set of targeted respondents was expanded to encompass all Burleith residents and/or owners. So I sent an email to all residents and owners in the BCA database on August 15. This email elicited a flood of additional authorizations from interested residents. A follow-up communication from DC to Kishan reported that of the over 70 yards inspected, one or more rodent holes were found and treated on 35 of those properties (nearly 50%): 16 on S Street, 11 on T Street, 4 on 36th Street, 4 on 37th Street. For future problems, be sure to check the Burleith website's Good to Know page for blank petition forms and detailed instructions on how to combat rodents and request DC assistance. Be sure your home has the address marked on the alley side. Quite a few homes still need to be marked on the alley, to make this kind of effort easier. This is important for emergency fire response as well. Remove food sources by making sure that supercans and recycling bins are securely closed and have no holes. Don't leave plastic garbage bags/cardboard outside your home or overflowing from the bins. Don't leave out extra bird feed or pet food; store food in metal or glass containers with tight lids. Clean up animal feces. Rodents communicate by leaving traces of feces/urine and often feed on dog droppings. Turn over or empty rain water from plant pots and children’s toys which can serve as a source of water for rodents. Remove weeds, trash, and debris near buildings and in alleys and yards. Keep vegetation in tree boxes trimmed and neat.